Back in June we reported on 23snaps, which we called a sweet, private social networking app for parents. The only real issue was that it was for iOS only. 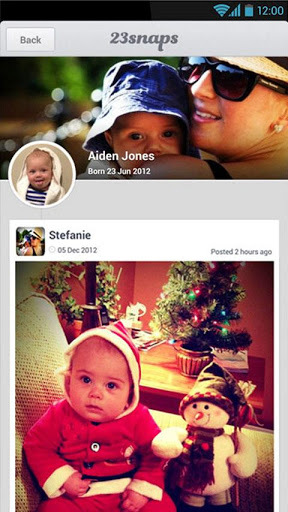 Now, however, the “Facebook for parents” app has landed on Android too, letting all the mums and dads of the world save and share snaps and videos of their kids with family and friends. In private. Indeed, with the likes of Facebook and Twitter actively promoting the sharing of information en-masse, there has been a small but steady movement against this tide – back in March, we wrote about Pair, a social network for couples which had hit 50,000 downloads and one million messages in four days. And Pair wasn’t even the first social network for couples. With 23snaps, the idea is to create an online photo album for your kids, that grows into a permanent digital record of their progress. The app should appeal to anyone averse to plastering their Facebook Wall with snaps of their offspring, whilst it simultaneously alleviates friends from being subjected to that millionth ‘cute’ pose your offspring seemingly strikes every day. If you’ve used a social network before, 23snaps shouldn’t take you long to figure out how to operate – it has a News Feed, Notifications, Friends list, and a ‘Manage your children’ section. 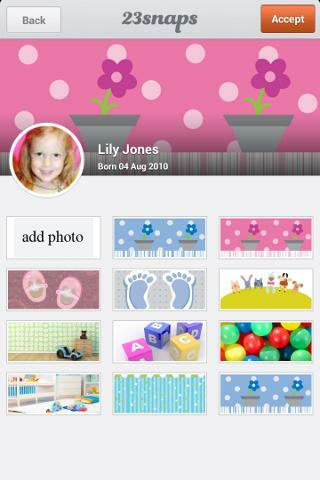 You can also add your partner on 23snaps, meaning parents can manage the timelines of the same children, while your connections (grannies, uncles, siblings and friends) are only able to follow your child’s upbringing. With the app, you can upload photos, status updates and even height/weight measurements. Connections can also receive real-time notifications when a new update is posted, and you can build themed ‘collections’, add photo filters and create interactive photobooks. 23snaps also has a Web-based portal, and we’re told a Windows Phone app is in the works. Interestingly, you’ll also soon be able to order prints for your favorite photos, proof that people still like to have physical-format photos too. Meanwhile, the Android app is technically still in beta so you may find a few quirks, but it’s live and available for anyone to download for free now.